If you are looking for a beachfront boutique resort, which may not be as large as some of the other 5-star resorts in the island, but offers classy elegance at every step of your stay and a romantic ambience, then this is the one for you. And additionally this has the best location advantage being on a prime site at Pantai Cenang which is the place of highest demand among tourists. And the resort is right on the beach. 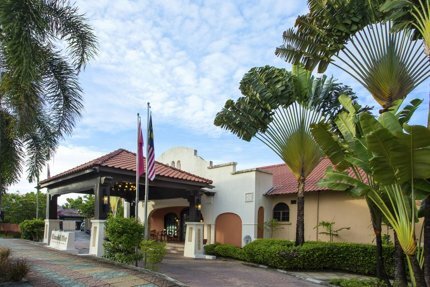 The entrance to the hotel is from the main road Jalan Pantai Cenang. However the restaurant, the beach bar, the pool and the rooms are all located near the beach. The hotel has been refurbished in 2011. Rooms now have wooden floors, large sliding picture windows from floor to ceiling, lovely soft beds and many other new features. There are 34 rooms of different types but all with sea views. If you can afford, choose one of the suites - either deluxe or junior. Not much difference between the two other than the size. But both are large enough and beach front. Special features in the suites include a large living room with wonderful view of the ocean through large window. The suites have large flat screen TV in the living room and a smaller one in the bedroom. Each suite also has four poster beds, two fairly large balconies with hammocks. Other rooms types include beachfront and sea-view studios. Both are essentially the same although the beachfront studios (more like cottages) are closer to the beach. Both have lovely private patios with garden setting, chairs and tables where you can relax and have cup of tea. Both have great ocean views as well. Other room features and amenities include ceiling fan as well as air conditioners, LCD TV, hair dryers, iPod docking station, mini bar, in-room safe, free wi-fi, IDD phone etc. 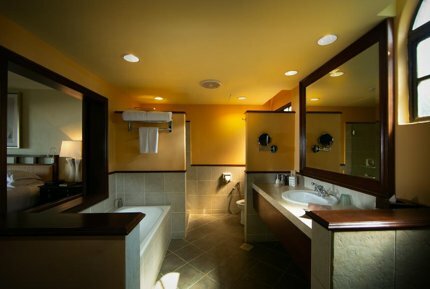 During the refurbishment the hotel has added a shower room next to the main lobby so that guests who have checked out but waiting for late flights can freshen up whenever they want. This is the kind of details which the hotel has been looking into. There is also a small but cozy DVD and book library in the property. In the backside and just before the beach there is a nice pool. And there are enough lounge chairs out there. They provide fruits, iced water and towels everyday. And as part of the hotel's service, they offer ice creams and pastries at the beachside. The restaurant extends from the wine room located next to the library through a covered area to outside area near the beach and under the coconut groves. 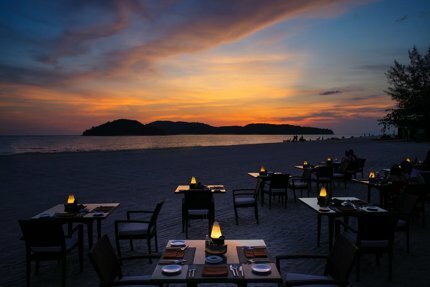 If you dine outside, you get wonderful view of the ocean and of course an unforgettable sunset. The cuisine is Asian and Western, food is excellent and service is very good and friendly. In one occasion when we had to wait for our table in spite of having advance reservation, we saw the urgency in the staff, their apologetic behavior and how they went out of the way to compensate for their mistakes with superb service. They can also set up a private romantic candle lit dinner for you right on the beach. This is however limited to only one table per night. This is an ideal way to celebrate your honeymoon or anniversary. The beach bar is a straw roofed hut with high chairs around. It's well stocked with spirits, beer, good selection of wine etc. They make great cocktails as well. 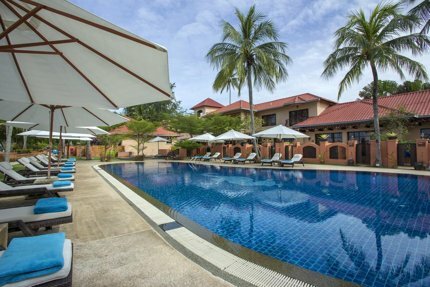 There is also a Spa in the resort which uses fresh local ingredients and offers traditional Malaysian therapy and massages. The spa also offers several other treatments like back massage, facials, wraps, scrubs etc at reasonable prices. The spa is relatively small, but quiet and serene. Requires several steps to climb. The hotel also has Jacuzzi and fitness center. The hotel has its own motorized boat and a sail boat which can be chartered by the guests. The 42-foot motorized boat can be chartered for island hopping. You can take it on your own or they can provide crews. They also have a speed boat which can drop you to a secluded island beach where you can have a private romantic picnic in a comfortable tent with your own mini bar and food. They can set all that up for you. What more, you can also rent bikes and kayaks from the hotel. Location is a great advantage. All types of shops and restaurants are all within stones throw. Taxis are also available just outside the hotel. Casa Del Mar is all about details, elegance and excellent staffs and service. Beach and ocean view from all rooms. The resort is right on the beach. Rooms are large and excellent with modern amenities and very clean. The management is very pro-active in looking into practically all aspects of guest requirements. There is an ongoing effort for continuous improvement which is evident the moment you walk in.